The Twain Shall Meet: Don Cherry Enters the Political Circus! As Circuses go, I think it was mildly amusing, but I ride a bike and worry about my neighbours, and their rights which I am guessing makes me a left wing pinko type in Don's World. And as a left winged pinko type, my opinion is that whenever you can get a senile old white guy in an oddly tailored Hot Pink Suit to finish a speech in Toronto City Hall with the words "Put that in your pipe... You left winged, Kooks", It is a good thing for the left because it demonstrates the worst of the Right. Vive Le Cirque du So Lame! Is Don Cherry yet another old Conservative after a Senate seat? Hard to say. But probably not. He sure did not seem Senatorial at City Hall in Toronto and certainly his whole act was inappropriate, to say the least. At least Rob Ford seemed to like it. I suspect that most of Canada would rebel at the thought of this bombastic dandy strolling through the Halls of the Canadian Senate dressed like a harlequin jester and claiming that he knows anything at all about politics or had any experience with "sober second thought." Is he about to throw an odd hat into the political arena and run as a Conservative MP? God I hope not, the last thing we need is another maudlin old fool in Ottawa. His militarisation of HNIC alone is enough to show us all how he would fit into Harper's attempts to glorify the military and to Americanise our attitudes. But at any rate, it seems unfathomable that a man would be invited to visit City Hall in a World class city, to introduce a new mayor to the people, and act like a such jerk. He should be unelectable. So, what was the reason? A Smoke Screen? A Change of Channels? Again, I'm not quite sure but I have a few thoughts on the subject: From what I can see of the right wing approach to vote gathering, it is likely that his sudden appearance on the Canadian political scene has to do with their constant but completely false claim that they represent the common man. They have somehow quite successfully managed to convince some 34% of voting Canadians that they (the Conservatives) are not elites, and that it is incumbent on this base to vote repeatedly for huge tax cuts for the rich and the powerful Corporations, and that doing so is somehow magically going to translate into gains for the middle class. It is amazing how many people they fool really. I will give them this though: Don Cherry is common. But to argue that he is not also among the elite or that he represents the middle class, or Canadian values is preposterous. Mr. Cherry: It is one thing to expect this country to forgive you for dressing up like a harlequin jester and acting like a complete jerk within the context of a trivial TV spot on a Hockey game (and even that took a bit of getting used to). It kinda snuck up on us. ...I mean you didn't always dress that way. We just got used to it, over your long career. Dress appropriately next time Don. Dress like a "Star Candidate" and not like Dame Edna. Now, Dame Edna He/She can pull it off, it's what He/She is paid to do! Here is Cherry Telling us how Much he knows and about What. There is a lot more to good government than just changing the lines. And just because Harper pretends that running a country is somehow about hockey should not make Don Cherry relevant. He is not relevant, nor is this ad that he (the so-called common man ) was paid a purported $2,000,000.oo for. It would be hard to argue that he knows anything at all about Suits. Almost no one I know dresses like he does or would be caught dead dressing like he does, at least not unless it is Halloween. Does he Really know Hockey? ~ " Anyone remember this Don Cherry quote? "Mark my words. Corey Perry will be the best out of the three (sadly he was talking about ~ Crosby, Ovechkin, & Perry)." ~ Don Cherry before Sidney Crosby was drafted. Funny how he has never followed up on that bold prediction. When he predicts something and it happens, we have to hear for the rest of the calendar year yet he never follows up on his wrong predictions (which is 80% of the time). Give me break. There is absolutely no chance in Hell that Perry winds up better then Ovechkin and Crosby. And Here is my favorite Cherry Fact. Don played one game and one game only in the National Hockey League. And as he demonstrates daily, He Remains POINTLESS! He does seem to know dogs! He picked Fantino, he admires Ford, he loves Stephen Harper and he thinks Mackay is lovely. 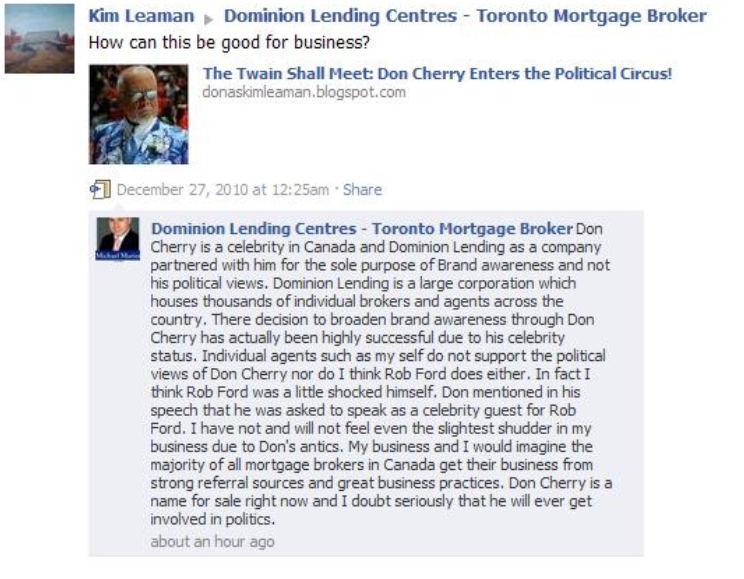 I Believe Cherry also when he says that he knows very little about Mortgages. I'll bet that he has no mortgages that he could not pay off any day of the week. If he did, he would already realise that Canadians will not be able to pay the mortgage on Harper's terms. The government that he so willingly and pompously endorses has Mortgaged Canada's future while buying up votes with slick, subliminal and mind-numbing spending campaigns. He would know that his trip to Afghanistan on Christmas Day is not a luxury that those with Mortgages can afford to pay.. It is hard to believe that anyone can support this government's wasteful habits and especially so while so many of us are out of work as they Arrogantly give billions more in Tax Cuts to big Oil. He knows nothing about Mortgages. No, Cherry knows very little about much of anything but dogs. This may explain why these ads are ^NOT being aired lately. There are rumours in Kingston that he may be running here. They have no candidate yet. If that turns out to be true, how do you suggest that I get a copy of this to all of those in Kingston who can help stop him? Any suggestions Emily? Is there a Kingston Facebook page that I should know about? Or anyone I could approach? Let me know, and not necessarily here of course. God deconstruction of this embarrassing anachronism, Kim. Love the Freudian slip Art, Afterall "God deconstruction" is going to Hell isn't it? Or maybe it is turning to salt, or being hit by lightning. In any case, it's all part of the plan of the great typo in the sky!